The history section is divided into pre-1900 and 1900 onwards, which will be found on the sub-pages. There is also a sub-page for the June 2011 service on Iona. All information is presented in good faith and is intended to be as factual as possible, but The Clan Donald Society of the Highlands and Islands cannot be held responsible for its accuracy. Note: Corrections and additions are most welcome. 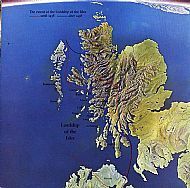 The map shown here (click to enlarge) is reproduced with permission of the Clan Donald Lands Trust and the maps shown on the History up to 1899 are reproduced with permission from Mountain High Maps Copyright 1993 Digital Wisdom, Inc. Cartography Phillip Winton. 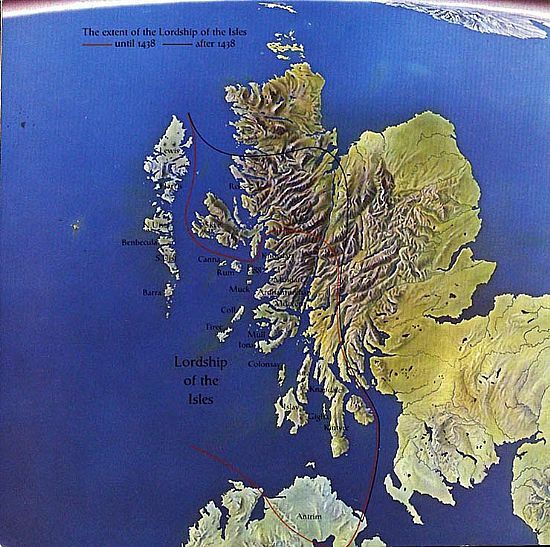 They are contained in "The Historical Atlas of the Celtic World" by John Haywood, Thames & Hudson Ltd., London. The Clan Donald USA Society have produced a comprehensive list of the surnames that are associated with Clan Donald. The list can be viewed from this link.